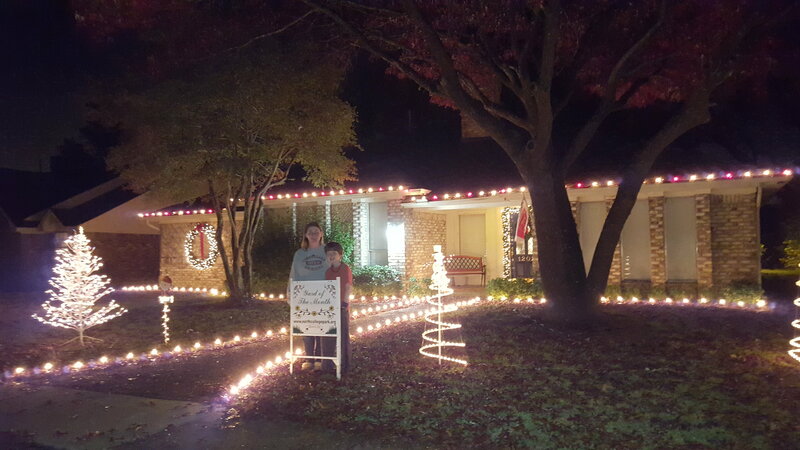 A sincere thank you to the North College Park Neighborhood Association for sponsoring the December Yard of the Month cash prizes and to Isabelly’s Chocolate & Treats for contributing gift certificates. 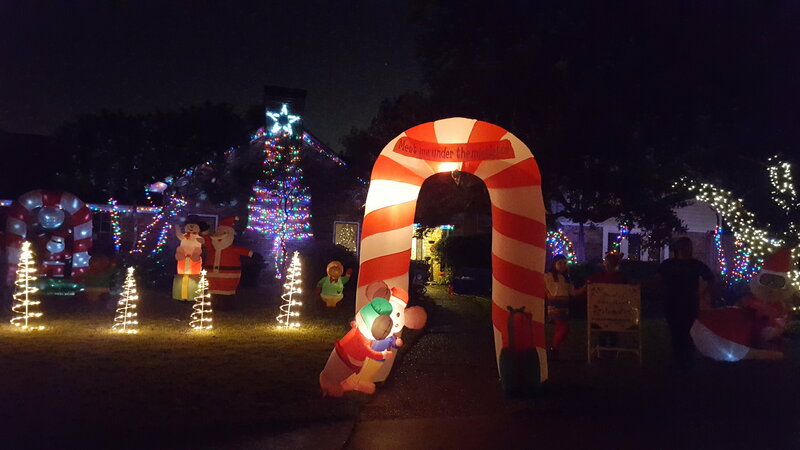 Yard of the Month First Place Winner: Jonathan and Kira Casimir – 3 Briarcrest Court – This holiday theme was ablaze with color and various themes – the Committee especially loved the holiday tree and star on top. A festive display of creativity with lights andinnovative styling. Awarded a $100 cash prize from the North College Park Neighborhood Association. 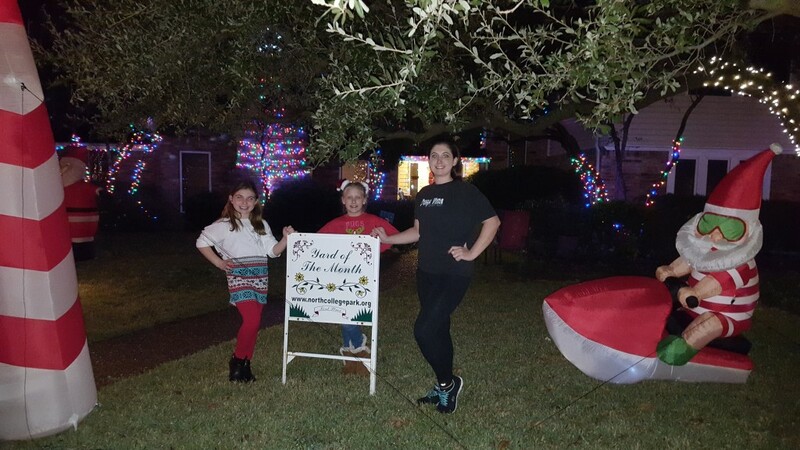 Kira Casimir and her two “elf helpers” (daughter and a friend) in front of their Yard of the Month display at 3 Briarcrest Court. CONGRATULATIONS !! Yard of the Month Runner-up: Scott and Gayle Dauer – 1202 Kenshire – Elegant, sophisticated, and tastefully-appointed red and white holiday theme highlighting ajoyfullawn display. Gayle and her son are pictured on their front lawn. Awarded a $50 cash prize from the North College Park Neighborhood Association. CONGRATULATIONS !! 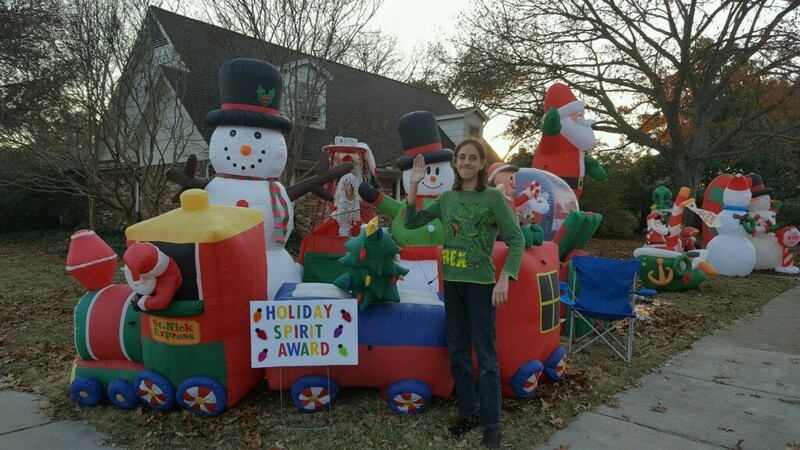 Yard of the Month “Holiday Spirit Award” – Freddie Ray – 1008 Rainbow Drive – pictured on his front yard, with his happy jumble of beloved holiday characters. Awarded a gift certificate from Isabelly’s Chocolate & Treats, along with some of their delicious cake balls. CONGRATULATIONS !! This entry was posted in Yard of the Month by jeslaughter. Bookmark the permalink.